(Feb 16): Snap Inc set the valuation on its initial public offering at between US$19.5 billion and US$22.2 billion in what could be the third-biggest technology offering of the past decade, people familiar with the matter said. 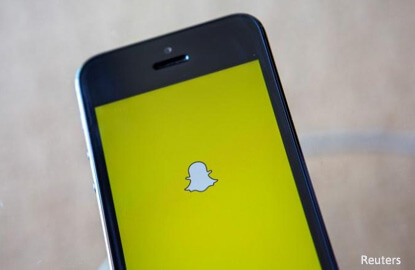 The maker of disappearing-photo application Snapchat is valuing its shares at US$14 to US$16 on a diluted basis, the people said, asking not to be identified as the details are private. It could be the biggest technology IPO since Alibaba Group Holding Ltd raised a record US$25 billion in 2014. Snap is the first US social-media company to go public since Twitter Inc debuted more than three years ago. Next up for Snap is the roadshow, where management will travel to cities including Los Angeles, San Francisco and New York to pitch the stock to prospective investors. Snap’s revenue climbed sixfold last year to US$404.5 million, compared with US$58.7 million in 2015. Net losses widened to US$514.6 million from US$372.9 million in that period. While management is sure to tout its revenue increases, Snap may face questions about its user growth, which slowed in the second half of 2016. By the fourth quarter, average daily active user growth fell below 50 percent in those three months for the first time since at least 2014, according to the deal prospectus. A representative of Snapchat declined to comment. Details of the valuation was reported earlier by the Wall Street Journal.